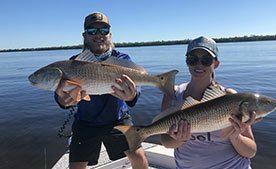 A group of Canadian friends wanted to experience fishing on the flats of the inter coastal waterway so we booked a fishing charter with this company. Tyler was an amazing guide who has great gear and a lot of experience. He took us out on his boat where we able to catch several species of fish. Trout, redfish, snook and a few other species.He has a perfect attitude to be a guide for a bunch of old guys with varied fishing experience. We had a pro fisherman on our boat and a newbie. I come from a commercial fishing background. He was great with all of us. The other boat, run by a hose dragger friend was much the same. We enjoyed the experience so much that we went out to lunch with them at an amazing dockside fish restaurant. Captain Tyler provided a very enjoyable fishing trip for us. He was a pleasure to fish with and a hard worker. His boat and fishing tackle were first class. 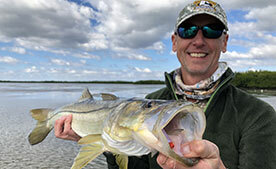 Although I had experience with inshore fishing in northern Florida, I had never caught a snook. What a charge to catch a nice snook on the first cast with Captain Tyler! We caught several more that day. I would highly recommend fishing with Tyler. I hope to catch my first tarpon with him soon. 4 of us came from New York to fish for tarpon. Tyler got all four of us hooked into some incredible fish. He really knows his stuff and his whole set-up is top notch. We will be coming back!! Tyler was an excellent guide- worked with our schedule accommodating multiple fisherman in our group– he was very smart about locating the Tarpon and stuck with us through poor weather conditions ultimately hooking eight Tarpon in two days. 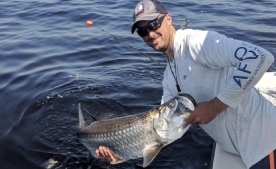 Capt Tyler is one of the Charlotte Harbor area’s best guides for Tarpon and backwater. I’ve chartered with him 3 times and he always delivers fun and fish on the hook. He’s well known by many of the other guides in the harbor area and that is key to me in booking with any guide. Some friends and I were down in Ft Myers for a bachelor party get away. Decided to do some fishing instead of the normal bachelor party activities. Me and one other guy ended up on Tyler’s boat and we were very glad we did. We had some experience fishing flats areas up around Carabelle/St. Marks/Keaton area but never been out snook fishing. Captain Tyler was outgoing and very personable which is something you definitely want to have in a captain when you spend 6 hours with them on the boat. We could tell he was very passionate about fishing and 100% loved to do what he does every day. He was extremely knowledgeable about the fish, seasons, tides, bait, water temps and basically anything and everything a captain needs to know. He put us on the fish!!!! We caught a variety of species including speckled trout, red fish, and as many snook as we could pull in (I think the count was around 70 fish after all was said and done) Had an amazing experience all around which was topped off by a 15 minute battle of will and determination with a 12 LB, 34″ Snook! I am already in the process of planning my next trip down there because the Snooks got me Hooked! Fished with Tyler for a couple of sessions with work colleagues and clients. Tyler was extremely personable and knowledgeable. Knows those waters very well. The target was Tarpon. He did a great job of putting us on fish. Very impressed that he didnt stay with the Fleet. He found his own fish away from everyone else. Would highly recommend him and would definitely book him again. At Fish Charlotte Habor, you will find the only the best of the best tackle will be on board. Captain Tyler Gulau offers fishing trips that create long lasting memories. 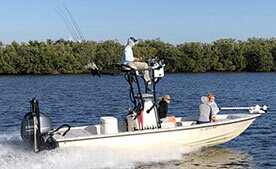 Available are completely customizable trips for tarpon, snook, redfish, trout, and so much more. Call today to book your fishing charter!